Previous research has shown that it is possible to experimentally induce interpretive biases using ambiguous scenarios. This study extends past findings by examining the effects of manipulating interpretation on subsequent memory. Participants were trained to interpret emotionally ambiguous passages in either a positive or negative direction. Transfer of the training to novel scenarios was tested. Following training, participants were also asked to recall details from these novel scenarios. The results indicate that the training was effective in inducing the intended group differences in interpretive bias. Importantly, participants exhibited memory biases that corresponded to their training condition. These results suggest that manipulating interpretive biases can result in corresponding changes in memory. Findings from this study highlight the importance of future research on the relation among cognitive biases and on the possibility of modifying cognitive biases in emotional disorders. Tran, T., Hertel, P. T., & Joormann, J. (2011). 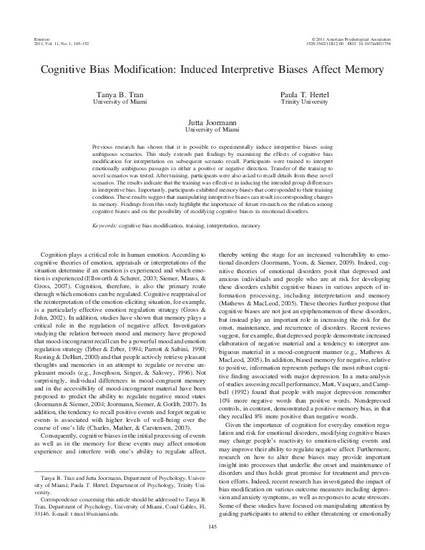 Cognitive bias modification: Induced interpretive biases affect memory. Emotion, 11(1), 145-152.